There's little doubt that low-fat, low-carb, nutrient-dense spinach is a superfood, given its vitamin and mineral content. Eaten raw, the leafy green's powerful antioxidants and inflammatory properties provide a multitude of nutritional benefits, such as improving the health of your eyes, combating depression and lessening your risk of chronic disease. Yes, eating raw spinach is good for you. Spinach is packed with nutrients your body needs for good health, including fiber, folate and vitamins A, C and K. Plus, it's super low in calories. With only 23 calories per 100 grams, or 3 1/3 cups, in raw spinach you might want to include this healthy vegetable in your diet often. For reference, you would need 1 pound (450 grams) of fresh spinach to make about 1 cup of cooked spinach. Spinach is low in fat and carbohydrates, so if you are on a calorie-restricted diet and trying to lose weight, adding spinach to your diet is a good choice. Providing 2.2 grams — 6 percent of the daily value (DV) per 100 grams — of mostly insoluble fiber, spinach benefits your digestive system by adding bulk to the food that passes through your intestines, which may help prevent constipation. Increasing your intake of dietary fiber aids in bowel health and makes you feel full for weight management. The fiber content in spinach has an advantage particularly for those with type 2 diabetes. Dietary fiber is known to protect you from many gastrointestinal diseases, hypertension, colon cancer, constipation, hemorrhoids, gastroesophageal reflux disease, ulcers, diverticulitis, obesity, diabetes, stroke and cardiovascular diseases. Raw spinach offers 2.9 grams of protein per 100 grams. Protein is vital to virtually every cell in your body. You need protein for building and repairing tissue, including your bones, muscles, cartilage, skin and blood. Protein is formed in your body from the combination of organic compounds called amino acids. Some amino acids are made by your body; others you must get from your diet. Most plant foods do not individually contain all the "essential" amino acids required to make the protein your body needs. Spinach contains all nine of the essential amino acids, which technically makes it a complete protein. However, the green veggie isn't a significant source of histidine, so you'll need to supplement with other foods to get what your body needs, such as grains, beans or meat. One of the amino acids contained in spinach is known to help with the symptoms of depression. Tryptophan is a precursor to serotonin, which is a neurotransmitter that regulates processes in the brain including depression, emotions, mood, aggression, anxiety and sleep. Cooking spinach increases the protein content by a minimal amount because of the increased density per serving of the cooked spinach. Cooking, in general, may increase the nutritional content of a food if water is driven out in the cooking process. Spinach is a good source of riboflavin, offering 11 percent daily value per 100 grams. Your body needs riboflavin to break down carbohydrates, proteins and fats to provide energy. Spinach leaves are also rich in vitamin B6, with 10 percent DV, needed for brain development and your immune system. Additionally, spinach contains folate that promotes heart health and helps prevent birth defects. Other B vitamins include niacin, pantothenic acid and thiamine. Per 100 grams, raw spinach has more folate than cooked — 194 micrograms compared to 146 micrograms, respectively. The folate in spinach is also involved in forming neurotransmitters, including dopamine, norepinephrine and serotonin. As a result, folate is a useful natural treatment for depression. Another benefit of spinach is its exceptionally high vitamin A content, with 9,377 international units delivering 188 percent DV in just 100 grams. Vitamin A is best known for its support for good eyesight. The vitamin is also essential for many other functions in your body, including a strong immune system, as well as reproduction and cellular communications. Vitamin A also plays an important role in the maintenance of the health of your heart, lungs and kidneys. You may associate beta-carotene with carrots and other orange veggies, but 100 grams of spinach contains 5,626 micrograms of this precursor to vitamin A. That's almost 70 percent of the amount of beta-carotene found in an equal amount of raw carrots. By cooking spinach, the plant's thick cell walls are broken down, which raises the beta-carotene concentration, making it more readily available for absorption into your bloodstream. Cooking spinach increases beta-carotene to 6,288 micrograms per 100 grams, according to Nutritional Value. The vitamin A is also more easily absorbed by your body when the spinach is cooked. Read more: How Much Vitamin A Should You Take Daily? Also known as ascorbic acid, vitamin C is essential for the development and maintenance of connective tissue, bone formation, wound healing and healthy gums. As an antioxidant, vitamin C is important to your immune function and may help prevent or treat numerous health conditions, including cancer, cardiovascular disease and eye diseases. With 28 milligrams of vitamin C, raw spinach fulfills 47 percent of your daily value. As a bonus, vitamin C helps you absorb the iron in spinach. However, heat destroys vitamin C, so boiled spinach only has 9.8 milligrams, which equates to a loss of 187 percent. Steaming or microwaving may lessen cooking losses, according to the National Institute of Health. Spinach contains a significant amount of vitamin K — a whopping 483 micrograms supplies 604 percent of the recommended daily value. Vitamin K's most important role is assisting in blood clotting, known as coagulation. Vitamin K is also useful in protecting bones from osteoporosis and helping with the prevention of inflammatory disease. Studies also show that vitamin K is beneficial in the prevention and therapy of bone and vascular disease. Be aware that eating large amounts of spinach may be dangerous if you are taking warfarin or other blood-thinning medications. Vitamin K can lessen warfarin's effectiveness or cause excessive bleeding. Spinach is rich in an array of minerals, especially manganese. Stored in your bones, liver, pancreas and kidney, manganese plays a role in fat and carbohydrate metabolism, calcium absorption and regulating your blood sugar. Spinach contributes 45 percent DV with 0.897 milligram of manganese per 100 grams. Spinach is an excellent source of iron, supplying twice as much as other leafy greens. Raw spinach contains 2.7 milligrams of iron, while cooked spinach contains 3.6 milligrams per 100 grams. Iron absorption is influenced by the amount of iron already present in your body and by other nutrients that you include in your meal. For example, vitamin C helps with iron absorption, while other substances like tannins and polyphenols may inhibit iron absorption. Raw spinach also contains 79 milligrams of magnesium, or 20 percent DV. Other minerals in spinach are calcium, copper, phosphorus, potassium and zinc. To optimize the calcium, eat your spinach cooked. Cooking increases the calcium content from 99 milligrams in raw spinach to 136 milligrams in cooked. Cooking also increases the amount of magnesium that your body is able to absorb. The inverse is true with potassium, though — cooking spinach destroys 20 percent of the potassium in spinach. Spinach is known to help in both physical and mental health for reasons beyond its vitamin and mineral content. The polyphenols in raw spinach play a role in your body to reduce oxidative stress, which is an imbalance between free radicals and antioxidants in your body. Polyphenols help to protect you against chronic illnesses, including cardiovascular disease. Research shows that polyphenols in spinach may also help lower your cholesterol. 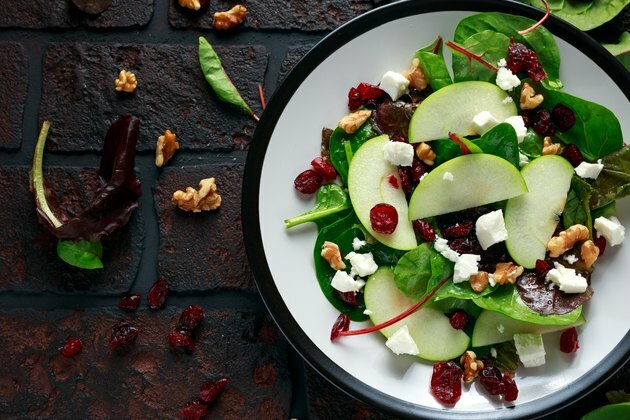 Taking into account that foods high in polyphenols have been associated with a reduced risk of oxidative stress-induced disease, a study was conducted to evaluate the antioxidant effect of spinach on cardiovascular health. Rats fed a high-cholesterol diet for 6 weeks displayed an increased oxidative stress with elevated blood and liver lipids. Feeding the rats spinach showed a beneficial effect in the reversal of lipid levels. Conclusions of the study, published in Preventative Nutrition and Food Science in 2014, reported the antioxidant properties of spinach may effectively lower fat and cholesterol. A study examined the effect spinach has on prolonged and excessive levels of stress in mice. The results, published in the Journal of Clinical Medicine in 2018, suggest that spinach has anti-stress and antidepressive effects by lowering blood corticosterone and increasing certain amino acid levels in the brain. Cataracts and age-related macular degeneration are the leading causes of vision loss and blindness in the U.S., according to American Optometric Association. Spinach contains two antioxidants, lutein and zeaxanthin, found in the retina of your eyes, that have been shown to help reduce the risk of chronic eye diseases, including macular degeneration and cataracts. Lutein and zeaxanthin protect the cells in your eyes by filtering harmful high-energy blue wavelengths of light. Unfortunately, your body cannot naturally make lutein and zeaxanthin. This is why eating spinach can help maintain good eye health. According to the American Macular Degeneration Foundation, Harvard University found that 6 milligrams per day of lutein lowered the risk of macular degeneration by 43 percent. Raw spinach contains 12.2 milligrams of lutein and zeaxanthin per 100 grams. A 2018 review focused on the properties of lutein and its effect on human health. The report, published in Nutrients, found that lutein not only has an effect on eye health but may have positive effects on cognitive ability and the risk of cancer and cardiovascular disease. You'll get the benefit of more lutein and zeaxanthin by eating your spinach raw vs cooked. Raw spinach contains oxalic acid, a natural compound that binds to calcium and can interfere with the absorption of calcium and iron. However, oxalates are broken down when heated, meaning cooked spinach doesn't have the same amount of oxalic acid. The oxalate content in spinach may pose a problem if you are prone to developing kidney stones. When oxalates bind to calcium, they are normally excreted. But under certain conditions, they may accumulate in the kidney to form calcium-oxalate fragments. These fragments can form larger crystals, or kidney stones, according to the National Kidney Foundation. If you don't test high for oxalate, there is no need to be concerned about eating oxalates in raw spinach, but eating calcium-rich foods in the same meal as spinach will help reduce the amount of oxalate being absorbed by your body. According to a report in 2015 in Clinical Nutrition Research, foods containing oxalates are safe, even for those with diabetes, hypertension and high blood cholesterol. However, people with kidney stones should limit oxalate intake. Mayo Clinic: Warafrin Diet: What Foods Should I Avoid? National Kidney Foundation: What Are Oxalates and Why Are They a Concern for Kidney Disease Patients? Produce Converter: How Much Spinach Is in a Pound? What Are the Effects of Too Much Spinach?